INTRODUCTION: Traditional insertion of a ventriculoperitoneal shunt (VPS) involves a small laparotomy incision. In addition to significant postoperative discomfort, the laparotomy portion of the procedure affects hospital stay and convalescence. Moreover, laparotomy incision may also contribute to wound /shunt infections and incisional hernias. Although laparoscopic approach to VPS has been reported, it has not been popularized. We aimed to analyze our technique of using laparoscopy for the abdominal portion of VPS placement in attempts to minimize the shortcomings of the traditional open method. METHODS: Retrospective review of all patients undergoing VPS placement at a tertiary care hospital. All patients undergoing laparoscopic placement of the abdominal portion of the VPS were identified and analyzed. Our technique of laparoscopic VPS placement included a 5-mm Optiview® non-bladed trocar for abdominal access and camera as well as an additional 5-mm working port. Main outcome measures included patient demographics, procedural indication, operative time, length of hospitalization, and complications. 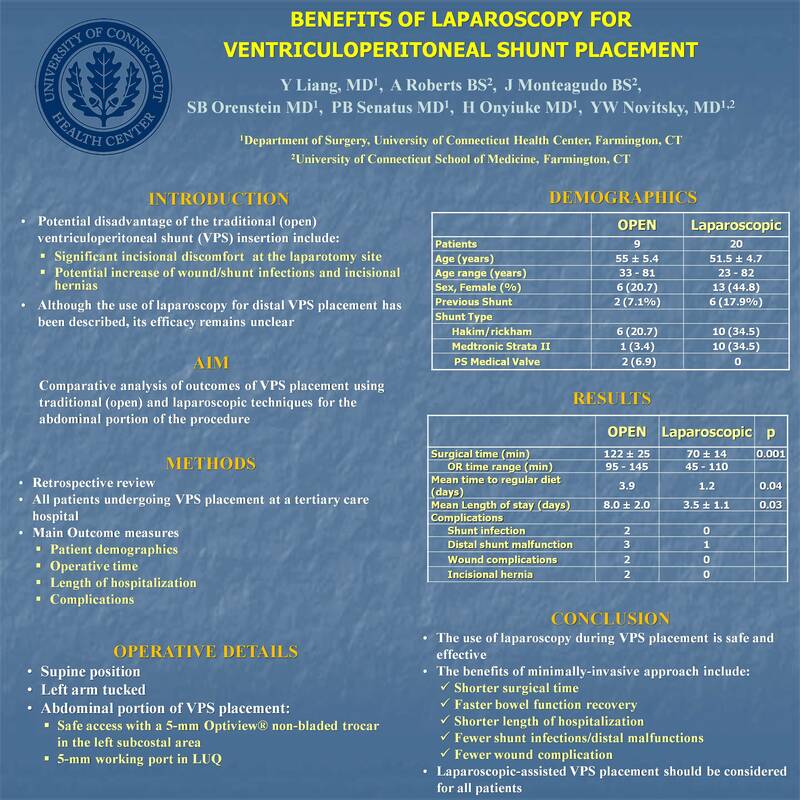 RESULTS: Between September 2006 and August 2009, 20 patients with an average age of 54 years (range, 23-82) underwent laparoscopic placement of the VP shunt. Hydrocephalus was the most common indication (n=12), followed by pseudotumor cerebri (n = 5) and neoplasm (n =3). Only two 5-mm trocars were utilized for all patients. Mean operative time was 70 min (range, 45 – 110 min) and the blood loss from the abdominal portion of the procedure was <10 cc in all cases. There were no intra-operative complications. The median length of stay was 2 days (range, 1 – 21 days). Both operative time and length of stay were significantly better than historic open controls. There were no post-operative complications related to the laparoscopic portion of the procedure. Seventeen (85%) patients were started on a regular diet on the first post-operative day. One patient required laparoscopic shunt revision 2 month after initial placement. CONCLUSION: The use of laparoscopy during VPS placement appears to be safe and effective. The benefits of our minimally-invasive approach include short surgical time, minimal perioperative pain, and brief hospitalization. In addition, laparoscopic approach essentially eliminated post-operative ileus, incisional pain and wound infections. We firmly believe that laparoscopic assistance should be considered for all patients undergoing VPS placement.